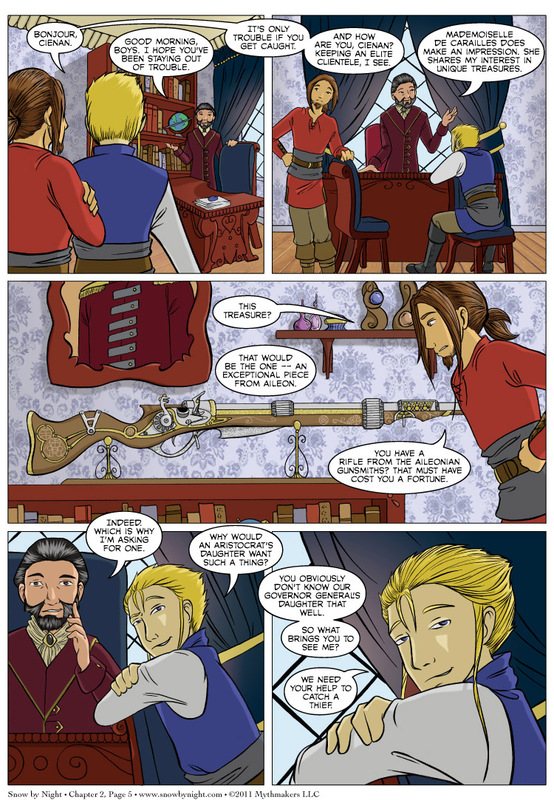 Chapter 2 Page 5 is up and we meet Cienan who is one of my favorite characters. As you might have guessed from the name, he’s not from Saronne. I’ll give some more details about him on Friday in this week’s almanac entry. But I won’t give too many. Cienan’s past is cloaked in mystery which is just the way he likes it. Otakon is this weekend. I’ll be there with Brittany and Diane. Many of our friends will be there as well — Jen Zyren Smith from LaSalle’s Legacy and Shazzbaa from Today Nothing Happened and Runewriters. For a full list of Artist Alley attendees, check out Otakon’s list. If you wish to see a preview of Jassart’s reaction to the conversation with Cienan, be sure to vote for Snow by Night on Top Web Comics. I suspect that foreshortening is the culprit, making Blaise’s hand look smaller than it really is compared to the rifle.